SALEM — The Salem track teams defended their turf Saturday. The Quakers totaled six victories on the afternoon and raced to the Division II district boys and girls team titles a second straight year at Reilly Stadium. Salem finished it off as both 1600-meter relay teams won with the best times in the area this season. Salem’s Seth Ameduri, Jackson Corbisello, Turner Johnson and Quinlan Rumsey won the boys race in 3 minutes, 27.90 seconds. Rumsey also captured the 400 dash (50.92) and Johnson was first in the high jump (6-foot-2). The Salem boys totaled 135 points, followed by Northwest with 80 and South Range 77. It is the Quakers’ ninth district team title in 17 years. South Range had four individual winners with senior Ian Pierson in the 1600 run (4:22.84), senior Cameron Tarr in the 800 run (1:59.48), senior Mathias Combs in the 100 dash (11.46) and senior Aaron Wire in the shot put (47-3 3/4). West Branch freshman David McKeiver won the the 200 dash (22.95) after claiming the long jump Thursday. The top four finishers in each event advance to the Austintown Fitch regional next Thursday and Saturday. The Salem boys totaled 13 regional qualifiers, while the Salem girls have 10. 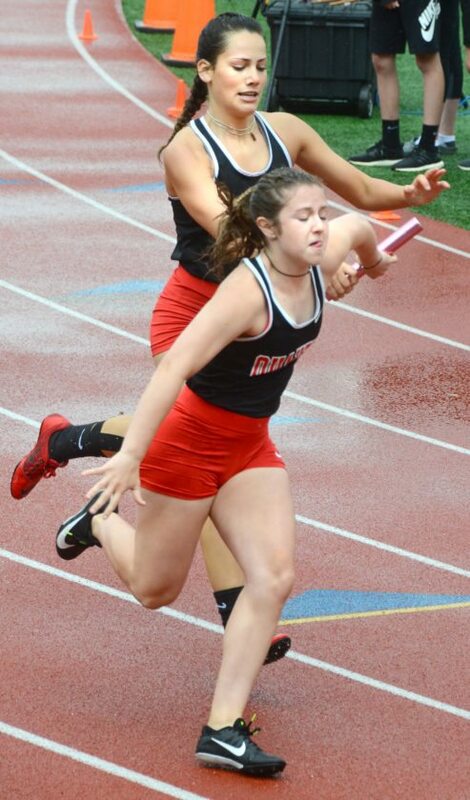 Winners for the Salem girls were Halle Cochran, Lydia McKee, Haley Rozeski and Katelin Chilton in the1600 relay (4:05.41), Rozeski in the 1600 run (5:19.96) and junior Caitlyn Marx repeated in the discus (134-7). The Quakers edged Marlington, 112-108, for the girls team title. Other girls regional qualifiers include Salem’s Carly Hall, second in the 1600 run (5:23.84); Salem’s Halle Cochran, second in the 400 dash (59.69); West Branch’s Carly Scarpitti, second in the 300 hurdles (48.60); South Range’s Kayti Aczel, second in the discus (122-6); Salem’s Haley Rozeski, third in the 800 run (2:20.63); Salem’s Kayla Jamison, fourth in the discus (111-11); South Range’s Bethany Crouch, fourth in the 400 dash (61.22). In the 800 relay, Salem’s Mackenzie Perkins, Lydia McKee, Paige Bailey and Katelin Chilton were second (1:48.06) and South Range’s Abby George, Bethany Crouch, Samantha Patrone and Delaney Less were fourth (1:50.85). Area boys regional qualifiers include Salem’s Hunter Christopher, second in the 3200 run (10:08.05) and fourth in the 1600 run (4:26.61); Salem’s Seth Ameduri, second in the 400 dash (51.28); Salem’s Trey Double, second in the 800 run (2:00.91); East Palestine’s Stephen Darlington, second in the high jump (6-0); Salem’s Zach Murray, third in the 110 hurdles (15.49) and fourth in the 300 hurdles (41.24); Salem’s Jackson Corbisello, third in the 800 run (2:02.15); South Range’s Spencer Bush, third in the 3200 run (10:16.55).West Branch’s Jeff Joseph, third in the 1600 run (4:26.33); Salem’s Josh Lehwald, fourth in the 100 dash (11.90). Boys relay teams advancing were Salem’s Turner Johnson, Andrew Tonkinson, Josh Lehwald and Zach Murray, second in the 400 relay (44.26); West Branch’s Griffin Lough, David McKeiver, Logan Castera and Cohen Lamp, fourth in the 800 relay (1:32.79); and South Range’s Mathias Combs, Hunter Higgins, Ian Pierson and Cameron Tarr, fourth in the 1600 relay (3:33.86).